Re: Are you Crafty ?? If you can sew, you can do it. It just takes time. I made a smocked apron when I was at school- not done it since either- 2 boys again! I like having a go at making things, they might not all turn out good, but I will have a try. I have a wall of cross stitch pictures here, I did them for MIL and Jims Aunt so when they both died I got them back! That's beautiful Lesley. It's so much more personal than picking something from a shop and I'm sure she will treasure it. I used to do a lot of cross stitch work until my fingers decided to do as they please rather than what I want, and a lot of knitting too. Things you have made yourself are so much more special somehow, aren' they? Just as long as it's finished by Chr present giving time will remember to do pics when it's finished. I do crewel embroidery and always have one on the go. I like to use lots of different stitches. The beautiful rag doll you made for last mid winter festival has inspired me to make one for Eva when she is a bit older. I'm not as talented as some of you ladies on here, but here are a few cross stitches I was pleased with. Wish I was better at sewing though! here is a make of mine- sorry it is sideways! That is really lovely. I'm sure lots of our chicken keepers on here would love to own it. I've never tried appliqué so I must put that on my list of things to have a go at. This better Pamela? 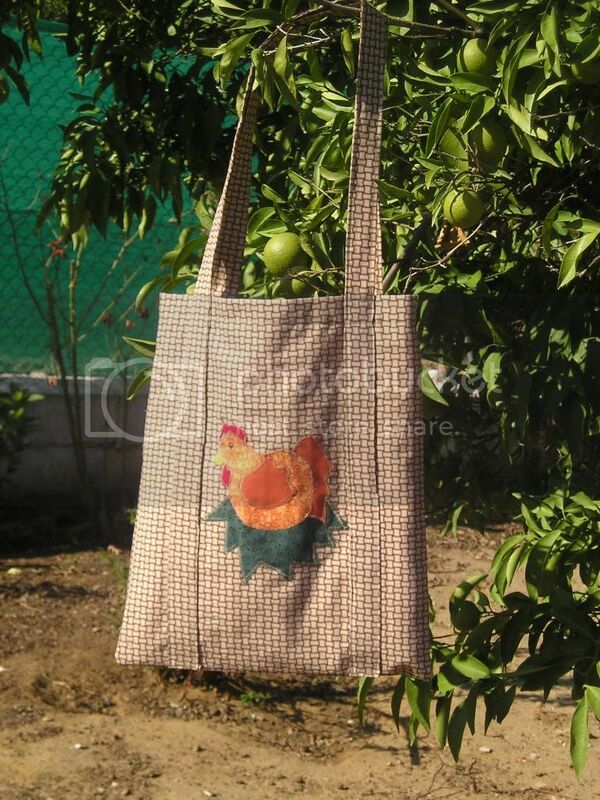 I love my shopping bag, but I didn't get a chicken on mine! My mermaid was my Nici's 30th Birthday card. I framed it, then stuck a blank card to the back of it. The tail is all metallicy and tiny shiny beads and her face is petit point.